If you can, pick up a copy of Australia’s contemporary and clever photography Magazine – [capture]. It is available in both print and online. I am featured along with several noted Australian photographers [contacts below] concerning what our perfect camera would be. Below is an extract from the feature article inclusive of my thoughts about what my perfect camera might look like. News Flash! We still have some places remaining on our up coming photography workshop in Havana, Cuba. If you are interested in going us view the details here and ping me an email with any questions you might have. …and also the audience. The audience’s insightful questions was a highlight and a catalyst for further thinking surrounding what is philosophically and politically important concerning still photography. Glenn Mckimmin the brainchild behind Aperture is going to do it again. This time in 2019 stay tuned for destination and date. Also, a reminder that Stephen Dupont and myself are taking bookings for our Cuba 2018 and workshop. Please visit Reportage [here] https://reportage.xyz or further details and/or direct message Stephen and myself on Instagram. International Convention Centre Sydney on 28-29th April 2018. Wat Prabat Nampu, Hospice for those living with AIDS. Lopburi, Thailand. 2004. Photograph made for the Positive Lives project. Positive Lives was a unique international project that commissioned photographers to document the impact of HIV & AIDS around the world, illuminating positive human responses to this world crisis. The project reflected the issues and emotions which confront people in their daily lives as they lived and worked with the disease. Issues of confidentiality, fear, prejudice, exclusion and survival, through to care, support, compassion, trust and openness were explored. Texts accompanied photographs authored based on the personal stories of individuals. By sharing these moving stories the Positive Lives project aimed to challenge stigma and discrimination, and disrupt the myths and prejudices that surround people living with HIV & AIDS. Positive Lives was a collaboration between photographers and a number of organisations, including Concern Worldwide and UK HIV charity, Terrence Higgins Trust. Concern has been at the forefront of community responses to HIV & AIDS and the fight for access to treatment since 1987. Clearly, this photograph above is emotionally laden and for some will prove confronting. Many would object to it being made in the first place let alone viewing it subsequently. Conversely, some people would suggest that it was essential that documentary photographers make photographs like this one and communicate the inhumanity that often accompanies them. So why the polarization of opinion? Join me and seven fellow Australian photographers speaking at Aperture Photography Conference 2018 in Sydney to understand more about the philosophies and politics underpinning a diversity of photography genres. This is Aperture Australia’s first photography conference, and TV journalist and photographer Ray Martin is its host. Live panel discussions will focus on how attendees can develop their skills, knowledge, and networking with first-hand experiences and tips from photographers. If you are passionate about photography then pen Australia’s APERTURE Photographic Conference for 28th & 29th of April 2018! It is a meeting of like minded souls and kindred spirits sharing a wealth of knowledge and experience about the medium of photography. We are taking bookings for Reportage Photography Workshops next workshop in Katoomba, Australia, 8th-12th Dec. 2017. Update: We are happy to announce this workshop is now priced in Aus$ representing a discount of Aus$520! Join Stephen and I (Jack) for an unforgettable experience in photography, place, and space. View from a graffitied train window in the Blue Mountains en route to Katoomba. ‘Graffiti’ is based on the Italian word graffio (which means ‘scratch’). It is a popular destination for day-trippers from Sydney and international travelers both lured there by its country town main street, cafes, galleries, and antique shops. But for a photographer, Katoomba is much more than that. Workshop Overview: This workshop is open to photographers who practice any genre and are at any level. We promote, support and are all inclusive of female photographers. Award-winning documentary photographer Jack Picone will work in tandem with workshop partner Stephen Dupont, the acclaimed photographer, and filmmaker. Both Stephen and Jack will critique and edit participants’ work one-to-one, and also take part in evening projections and discussions. Individual and group sessions are held to dialogue intensively on topics such as photographic composition, portraiture, basic camera techniques, how to research ideas and tell an original story, how to market a body of work, and how to hone your style. The workshop is very project based as opposed to technically driven. The aim is to produce a photo-essay with a striking visual narrative, to be projected on the final evening of the workshop. The workshop’s schedule will be demanding but highly rewarding. Application: The workshop is strictly limited to 12 participants. A AUS$500 deposit will be required at the time of booking to secure a place. This will be a popular workshop; please book early to avoid disappointment. Cost includes all workshop sessions. Cost is not inclusive of travel and accommodation. This video highlights the compelling photographs authored by participants’ who took part in our last Kathmandu Workshop, July 11-16, 2011. Our upcoming workshop in Kathmandu is: August 28th – September 1st, 2017 . Join us for an unforgettable experience! Reportage Photography Workshops will hold its second roving workshop in Kathmandu. Kathmandu is one of the world’s most atmospheric cities. Even as urban chaos encroaches, this “city at the top of the world” retains its unique aura of magic, mysticism, and tradition. Over the last decade its roughly one million inhabitants, who are squeezed tightly into the Kathmandu Valley, have also been experiencing a period of major social and political turmoil – from a fierce Maoist insurgency, government curfews, and censorship to mass demonstrations against royal rule and killings of protesters. Democracy was restored in 2006 amid jubilation, and the Maoists have since joined an interim government. Today, many Nepalis believe their country has entered a new era of hope and peace. Workshop Overview: Award-winning documentary photographer Jack Picone will work in tandem with workshop partner Stephen Dupont, the acclaimed photojournalist, and filmmaker. Both Stephen and Jack will be there to critique and edit participants’ work one-to-one, and also take part in evening projections and discussions. The aim is to produce a documentary photo essay with a striking visual narrative, to be shown on the final evening of the workshop. Tutors will hold individual and group sessions to supervise and edit the assignments, and dialogue intensively on topics such as photographic composition, portraiture, basic camera techniques, how to research ideas and tell an original story, how to market a body of work, and how to hone your personal style. The workshop is very project based as opposed to technically driven. The workshop’s schedule will be demanding but highly rewarding. Tutors and field assistants will be on hand constantly to help navigate any areas of difficulty and discuss all your photographic concerns. Interpreters can also be arranged where necessary. Traditional Photo Essay and Multimedia: During the workshop participants will have an option to produce a completed photo essay within the documentary tradition or in a more contemporary context, a multimedia. In both cases, tutors will be on hand to guide you through the respective process. Application: The workshop is strictly limited to 12 participants. A $500 deposit will be required at the time of booking to secure a place. This is one of our most popular workshops, so book early to avoid disappointment. Cost: US$1,950 includes all workshops sessions. Workshop cost does not include travel costs to Kathmandu and accommodation. Reportage Photography Workshops will hold its next roving workshop in Siem Reap, Cambodia’s fastest growing town and the jumping off point for the spectacular temple ruins of Angkor. With a maximum of 12 participants, the 5-day event will provide an opportunity to explore the cultural riches and social dynamism of this exotic corner of the world. Award-winning documentary photographer and Reportage workshop founder Jack Picone (and guest tutor to be announced) will lead the workshop. Jack and will be there to critique and edit participants’ work one-on-one, and also take part in evening projections and discussions. With the world’s most breathtaking ancient ruins on its doorstep, Siem Reap and surrounding areas offer endless photographic possibilities. The town itself has gone from backwater to boomtown in the space of a decade, and traditional Khmer culture coexists with the emergence of a new, hip generation of Cambodians. As well as the vast temple complex of Angkor, nearby are floating villages with traditional stilted houses, the rural beauty of Tonle Sap Lake and the flooded forest of Komplong Phhluk. An introductory get-together will be held on the evening of Sunday, April 9th before the workshop’s formal start on the morning of Monday, April 10th. Like any working documentary photographer, you will be given an assignment brief to interpret as you wish. (The brief will be announced prior to the workshop to give you time to research possible subjects before you arrive.) The aim is to produce a documentary photo essay with a striking visual narrative, to be shown on the final evening, Friday, April 14th. Tutors will hold individual and group sessions to supervise and edit the assignments, and dialogue intensively on topics such as photographic composition, portraiture, advanced camera techniques, how to research ideas and tell an original story, how to market a body of work, and how to hone your personal style. The workshop’s schedule will be demanding but highly rewarding. Tutors and field assistants will be on hand constantly to help navigate any areas of difficulty and discuss all your photographic concerns. Cost: US$ 1,950. Includes all workshop sessions. Workshop cost does not include travel costs to Siem Reap and accommodation. Application: The workshop is strictly limited to 12 participants. A $500 deposit will be required at the time of booking to secure a place. 10% discount (between 1st – 31st March 2017). 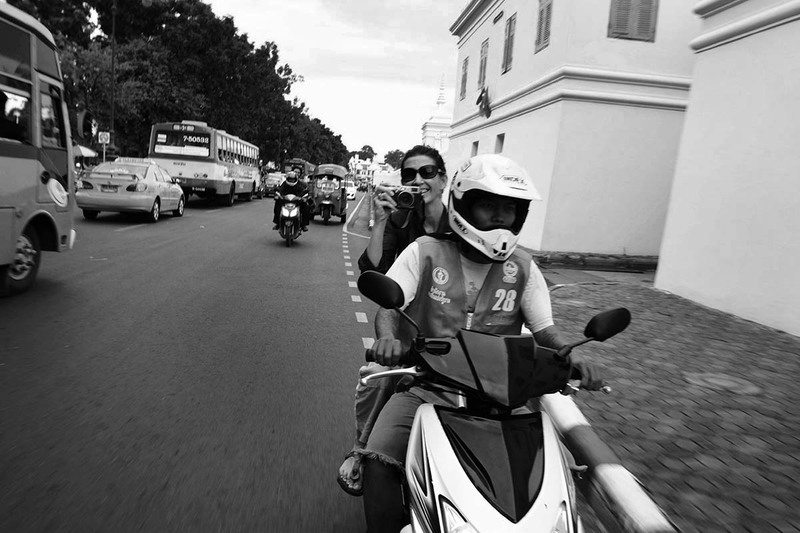 One – to – one participant Sandy Edwards during her tuition in Bangkok © Photograph by Jack Picone. “Thank you for a wonderful, informative, learning, fun, Buddhist, photography week in Bangkok”. Join Jack Picone for one – to – one photography tuition designed to address your photographic needs! It will be an extraordinary experience! What I teach you can’t be found on YouTube! *Discounts apply for couples and groups and for sessions five days and longer. *Concerning cost: Cost is below my day and half day rates that I bill editorial clients as a professional photographer. I have been working in excess of thirty years as a professional photographer for the world’s leading media publications. I have a Masters in Visual Arts and a Ph.D. in Documentary Photography. What I impart during one-to-one tutorials cannot be found on a YouTube video. What you take away is; knowledge that you will be able to apply over and over again to your own photography, elevating the aesthetic of your authored images – hyperbolically. Reportage Photography Workshops tutor Jack Picone delivers one-on-one tuition to individuals and groups (up to four) in Thailand and neighboring Asian countries. One-to-one tuition is for people who are interested in fast-tracking their photographic skill and vision. Tuition can be individually structured to accommodate photographers learning requirements. Jack is a working photojournalist and documentary photographer with extensive experience as a photography educator. (Above and below) One-to-one participants at work in Bangkok’s urban slum area, Khlong Toei. On location shooting instruction, intensive post-shooting editing, critiquing, sequencing and basic Photoshop. On a rolling basis 2016-2017. Book early to secure your ideal dates. (Above) Jeffrey Jue with local Nepalese photographer Sailendra Kharel, during a one – to – one tutorial in Kathmandu in Nepal. Please Note: We advise that all participants take out medical/travel insurance for travel to Asia. A Near Perfect Encapsulation For What a ‘Good Picture’ Should Do. A combat photographer since the Korean War, Eddie Adams joined the Associated Press team in Vietnam in 1965. He became famous for his 1968 photograph of Gen. Nguyen Ngoc Loan, chief of South Vietnam’s national police, shooting a Viet Cong prisoner in the head. Adams later regretted the picture’s notoriety, preferring to be remembered for his images of Vietnamese refugees after the war. Adams’s time covering the war and the searing photograph above marks fifty years since the start of America’s first televised war and is symbolic of how dramatic stories authored by photojournalists and journalists brought news about the war to the rest of the world.